Also interesting is the fact that there is a relatively even mixture of apartment complexes and homes — a cohabitation of owners and renters that doesn’t work so well in many other parts of San Diego. I lived in North Park near Morley Field for two years and never had a problem despite the foot and car traffic along Texas Street. In fact, if you’re looking for some good trick-or-treating action come Halloween, Texas Street is the place for you. In my opinion, much of North Park’s charm is the result of stable buildings and businesses, like the North Park Theatre or Claire de Lune Coffee Lounge, which have been around for years. The business district along 30th Street starting at University Avenue was first developed in 1911, but it seems there are always newer, hipper additions popping up that are worth a perusing. North Park also has an active night life and dining scene whatever your socialite status may be — and it comes without the hassle of Downtown’s one-way streets or expensive parking. If you’re willing to walk a little, you can find a space free of charge. Or you can always ride your bike. Claire de Lune coffee lounge. Literally the only downside to this place is they don't have wifi. 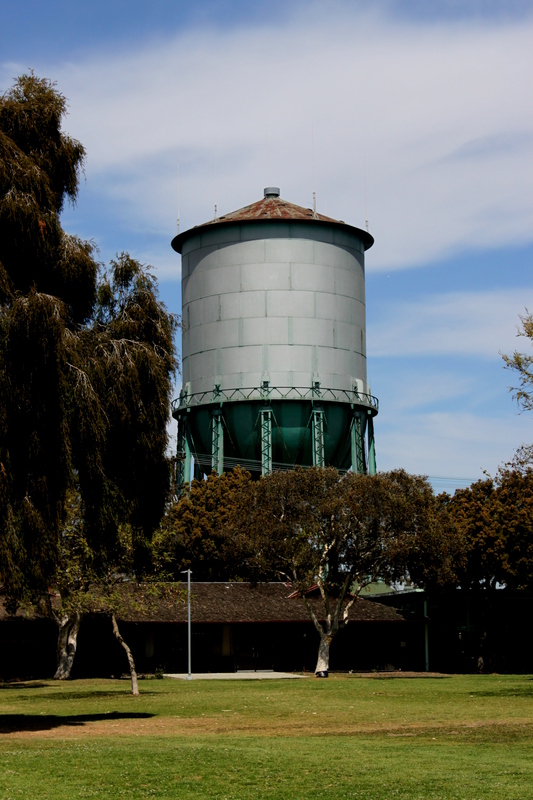 North Park's iconic water tower. North Park has a lot of street trees as well as trees in private yards. We shouldn’t underestimate the effect of trees in our neighborhoods, particularly the densely populated ones. Loved the murals! Well done Annie! Thank you, Anna! There can never be too many trees, in my humble opinion. Annie Lane – nicely done! Especially the murals – photos are very clear. And it did bring back memories as my aunt and uncle lived in a craftsman much like those you shot for 35 years. It’s funny to read your words how Claire de Lune is one of the older-established businesses, cuz to a dinosaur like me, it’s still part of the wave of newbieness. But definitely for the good. How many meetings have we had there over the last year? Ha! Yes, and good point. The time frame is relative … Claire de Lune has definitely been a staple for me. I did not realize there were no people in North Park…and where is the North Park sign? Then there are the shadier sides of the neighborhood. Yup, pretty much done…have fun. Not sure if Nadim meant the big classic signpost at 30th and University (wasn’t it originally a hanging sign, back when? ); or, perhaps, the Craftsman-style “gateway” structure situated, I believe, adjacent to Upas. Like that one a lot, and wish it had been included in this excellent photo gallery – how about it? Very nice. I’d love it if you’d do a photo essay like this for Point Loma! Thank you! Point Loma is on my list! The 30th Street and University Avenue North Park sign is included in this photo gallery. There’s no doubt people will find missing items if that is what you are looking for … North Park certainly can’t be fully represented in one gallery. Thanks for perusing nevertheless, and keeping me on my toes!